Product description: AWARD WINNING! BEST NEW PET PRODUCT 2009! Do you love your dog but not the drool, slobber and dripping that comes along with the breed? 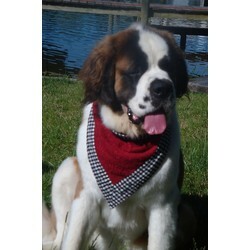 Than the Slobber Blotter pet bandana is the "must have need to have" pet bandana for you. Made with a soft, lightweight, 100% absorbent terry cloth fabric in red with a stunning cotton black and white check and a zig zag thread for extra detail. Black and white reverse for 2 looks in one. The Slobber Blotter is designed to blot the slobber and drool from your pooch’s face and fur and is long enough to help catch it before it hits the floor, the furniture or the car. No more drool rags and paper towels. Stylishly designed as a fashionable Bandabling. No one will know that they are wearing a child's bib, only a stylish pet bandana. Perfect for Bull Mastiffs, St Bernards, Newfoundlands, Great Danes, Rottweilers and all the other slobbering dogs we love. Adjustable snap closure. Just "Snap On, Snap Off" and go. GREAT for messy eating dogs, too. Machine Wash and Dry. Fade Resistant.